Leaders have the habit of going against conventional wisdom as a result of their obsession for progress. They're just not satisfied - in a good way - with the way things are. And this wiring compels them to make outlandish decisions that's beyond an ordinary person's imagination. 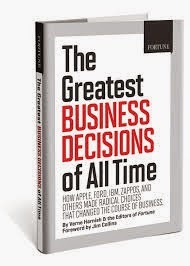 In the book, "The Greatest Business Decisions of All Time", the author described how Apple, Ford, IBM, Zappos, and others made radical choices that changed the course of business. To point-out the one trait that all great leaders have, we'll explore the decision one person made that triggered a nationwide consumer revolution in the United States, helping it become the wealthiest nation in the world and changing its economic landscape for the century that followed. The decision: On Jan. 5, 1914, Henry Ford doubled his workers' wages overnight. Henry Ford knew a thing or two about GENEROSITY. And while it may seem that his level of achievement is unattainable for most of us, we can certainly make a difference in this world by applying the lessons on generosity – the one trait all great leaders have -- into our own life. 1) There's always something you can give. If not your resources, it could be as simple as sharing your time with a person in distress, your skills and talents to a voluntary work, or emptying your cup of wisdom and experience to help equip a person who’s looking for a job. 2) You can never underestimate the impact of your generosity. If you make giving a habit, there will be days when people come up to you, thanking you for changing their lives by what you did for them – that you’ll sometimes have no recollection of. Real joy comes from knowing that you did everything in your ability to give your life to the things that truly matter to you, for we are hardwired to add value to this world. That’s why in doing otherwise, we invite misery – the natural consequence of selfishness – into our life. However, generosity can only flow through a person who understands that much has been given to them and they’re only able to give because someone has been kind to them too. And whether you acknowledge it, Jesus is the ultimate source of all blessings. He’s the one who gives, not just his resources, but His life as well. He's the reason for our generosity.